As you can see, the video shows nothing. This is an absurd story. There are bad drivers everywhere. There are angry drivers everywhere. Every day cars swerve into lanes and drivers flip each other off. Only when it involves Muslims does it become a hate crime. There is nothing to this story, but nonetheless it gets major coverage here as a hate crime. And note that terror-linked CAIR is using this trumped-up incident to try to compel Georgia to institute hate (sharia) laws. 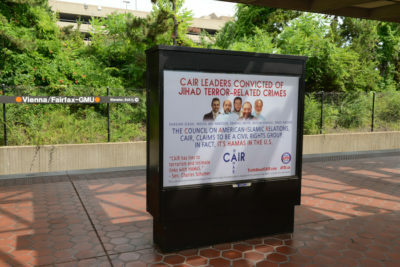 Hamas-CAIR needs anti-Muslim hate crimes to buttress its claim that Muslims are victims in the US and thus deserve special privileges and accommodation. But since real ones are so few, they have to make a great outcry over nothing incidents such as this one. DEKALB COUNTY, Ga. – DeKalb County detectives are investigating after a local family says a driver targeted them because of their religion. The family captured part of the I-85 incident on cellphone video, They told Channel 2’s Alyssa Hyman the two men were swerving into their lane and making obscene gestures only after making eye contact with the mom who was wearing a hijab. We’ve blurred the men’s faces because they are not yet charged with a crime. “What they’re doing is just harassment. It’s profanity,” one of the family members told Hyman. They are so afraid, they have asked to remain anonymous. The Council on American Islamic Relations helped the family file a police report this week. “First of all we believe that this crime, incident, was absolutely sparked by anti-Muslim bias,” said Murtaza Khwaja. Khwaja is an attorney for the Council on American Islamic Relations (also known as CAIR). “This isn’t a typical road rage response. It’s usually there’s a triggering factor or triggering event. That wasn’t the case here. There was just eye contact between a woman who was wearing a hijab and the two men on the left,” he said. Khwaja said he believe at the very least the men should face aggressive driving charges or even possibly disorderly conduct. He believes in some states, it could be considered a hate crime, but not in Georgia because the law doesn’t exist. “This is where our state legislature really needs to look at putting forth a really comprehensive hate crimes bill that doesn’t disproportionately affect minorities or vulnerable communities as it has in other states,” he said….